Jericho Sims denies a shot during Texas' one-point loss to VCU Wednesday at the Erwin Center (Photo courtesy of Texas Sports). 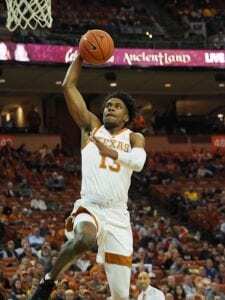 On a night things were slightly off from the start, the Texas Men’s Basketball team ran out of time before the horn in a narrow 54-53 loss to visiting VCU Wednesday. 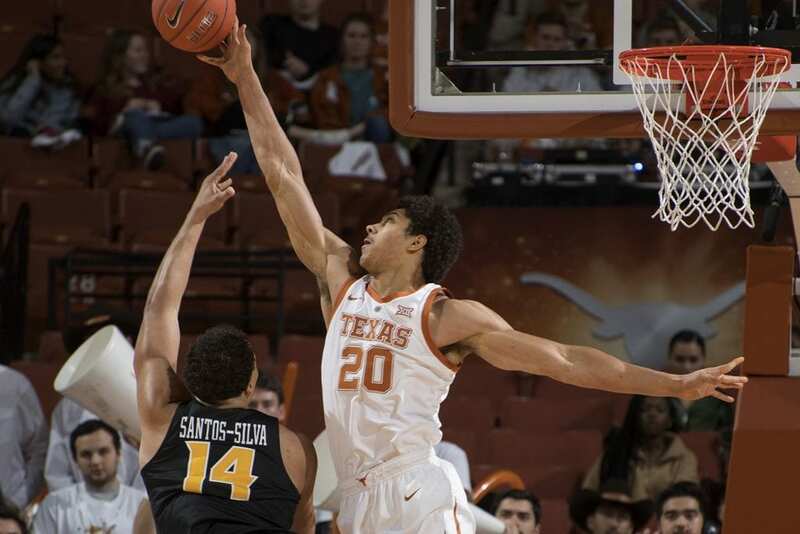 Jase Febres boosted the Longhorns off the bench but Texas couldn't overcome an early deficit in a 54-53 loss to VCU Wednesday (Photo courtesy of Texas Sports). 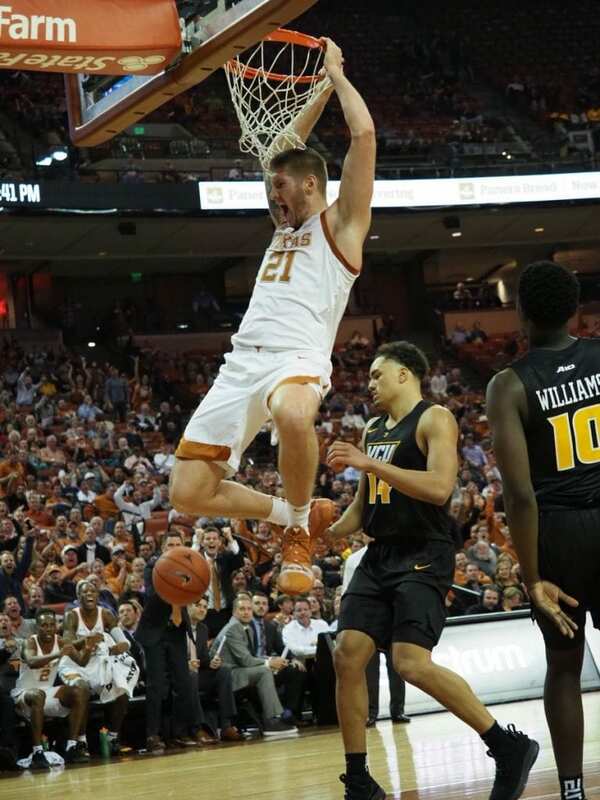 The Longhorns pulled within one point with 1:29 left to play in the game, but two chances to score down the stretch came up short as Texas took the one-point loss. The surprising loss is the second-straight defeat for the ‘Horns, who will host No. 24 Purdue Sunday 5 p.m. back at the Erwin Center. Somehow, Texas held VCU to just 28% shooting on the night as the ‘Horns stifling defense kept them in the game on a night offense was hard to come by. Texas held a 49-45 lead with just under eight minutes to play in the second half thanks to a 6-0 run sparked by Jase Febres and Osetkowski. The Rams responded in kind, though, rattling off seven-straight points for a 52-49 advantage. Jericho Sims paced Texas (5-3) with 14 points, scoring in double figures for a second consecutive game, while Dylan Osetkowski notched seven points to go with a team-high nine rebounds, two assists and two steals. Jaxson Hayes added eight points, three blocks and two steals, and Matt Coleman III added seven points. Starting today and going nearly every Thursday throughout the next few months, Texas head coach Shaka Smart will appear on Longhorn Weekly at Pluckers in West Campus. The show will tape at noon during basketball season and feature Smart along with special guests. The official one-hour weekly radio show of Texas' head men's basketball coach features in-depth conversation about the team. Craig Way, the Voice of the Longhorns, serves as the show's host. The show is held at Pluckers (2222 Rio Grande) before a live audience. UT students and Austin-area fans are encouraged to arrive early to the restaurant for seating. The next taping will be Dec. 13 from noon to 1 p.m.
Longhorn Weekly airs on radio affiliates across the state, including flagship 104.9 FM in Austin, and can be heard on TexasSports.com and the UT mobile app. Selected shows will air on Longhorn Network on Thursday nights (7-8 p.m.).